If there were 10 stars, that's what I would give..... Melissa and her staff were incredible; professional, accommodating, knowledgeable and an absolute delight to work with!! The food and service was top notch! The venue is obviously gorgeous and our wedding was exquisite! It was perfect in every way! Recommend them? ABSOLUTELY!! We got married at Winterthur on 9/22/18 and could not have had a more beautiful and seamless wedding!! Melissa and Brian were great to work with from our initial tour to the tasting to the wedding. Melissa was so helpful pricing up rentals and all sorts of catering options throughout the planning process. I really don’t know how she kept all of the little details straight but everything on our wedding day was exactly as we had planned and went off without a hitch. As for the venue itself, we’re still getting compliments on how beautiful and different the property is. We used the Reflecting Pool area for the ceremony and cocktail hour and Clenny Run for dinner. We got insanely lucky with the weather so didn’t need to use the rain plan which was the Gallery Atrium, but it’s a very pretty backup plan. It’s hard to come across a venue as beautiful as Winterthur where you can rent it all to yourselves and that’s exactly what you get here. Definitely go take a look at the spaces - you’ll love it! It doesn't get better than Winterthur. This is the most amazing venue, with incredible service, food, and people. We are over the moon with how our wedding went. Winterthur is hands down the best choice you can make for a venue. I cannot over emphasize how invaluable Melissa was from the moment that I arrived at Winterthur for a walk-through a year and a half ago to the moment I left my incredible reception 2 weeks ago. Melissa and her team were accommodating, knowledgeable, and communicative every step of the way. On top of that, Melissa was an all-around awesome person with the most calming demeanor. It was raining on and off all through my wedding day. 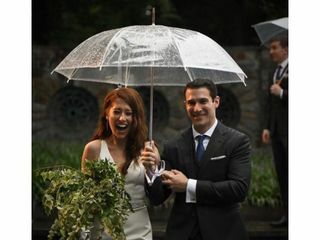 The ceremony was set to be outside so we had dozens of umbrellas at the ready in case the weather didn't agree with us. The team at Winterthur took what could have been a nightmare scenario and made it dreamy! There was an amazing team at the ready to hand out umbrellas to guests, keep seats dry, etc. And Melissa and her assistant coordinator Christine were so wonderfully chill and confident, it just shaped the whole vibe of the day in the most perfect way! The reception was such a blast, and Melissa and her team were always 2 steps ahead anticipating anything that we might need. I work in catering and I was legitimately amazed by how smoothly Winterthur's event staff handled everything. Winterthur is a stunning venue and if your event is in Melissa's hands then it is bound to be a world class party! 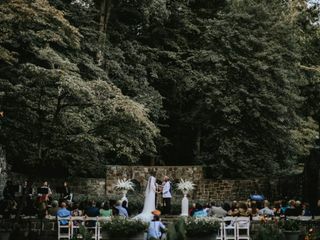 Melissa and the Winterthur were amazing with helping with the planning prior to the event and felt completely supported through the entire experience. She is a big asset for this venue and thankful that we chose this venue as the team went above and beyond for us and our guests. Melissa and her team made wedding planning so much easier! Winterthur responds to emails promptly, and always lets you know if a full response might take a few days. We had our ceremony at the reflecting pool and our reception at the visitor's center. We had a lot of handicapped folks at our wedding and Winterthur took great care of them. Not only are the shuttles handicap accessible, Winterthur also put extra tables in the areas of the reflecting pool where our handicapped guests were during the cocktail hour. The food is AMAZING. Seriously. The stuffed mushrooms and crab cakes were a huge hit during cocktail hour, and leading up to the wedding I was almost as excited to have their mushroom soup again as I was to actually get married. My husband and I HIGHLY recommend Winterthur! Melissa and the staff at Winterthur did an absolutely outstanding job. Everyone was so attentive, and the day ran seamlessly. Melissa was always happy to answer any questions we had, and was a pleasure to work with. Thanks for making our day so special :)!!! Winterthur was the best venue. We had our ceremony and cocktail hour at the reflecting pool, which was absolutely stunning. Since we lucked out with the weather, we were able to have our reception al fresco at the Visitor Center patio. All of the vendors that we used were from Winterthur's preferred vendor list, and they were all spectacular. Melissa and the entire team at Winterthur executed the day perfectly. Melissa is a great communicator, and is prompt and professional with her email responses. The catering was phenomenal, especially the cocktail hour bites (there were fun, reasonable, and creative upgrades - such as angus beef sliders paired with Dogfish Head 120 Minute tasters!). We cannot recommend Winterthur enough! Having our ceremony and reception at Winterthur was just wonderful. The setting was so beautiful and tranquil. With nice weather, we were able to have our ceremony by the reflecting pool and the reception in the Galleries Atrium (the lobby to the museum). We couldn't have been happier with the beauty of the location and the first class treatment we received. Melissa and her team were a pleasure to work with which we really appreciated. She was responsive and gave good advice throughout the process. Additionally, the food was just divine. We received so many compliments and it is a day we won't ever forget! 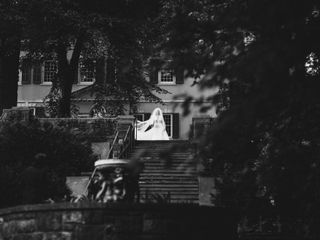 My husband and I got married a few weeks ago at Winterthur Museum by the reflecting pool it was an absolute beautiful day and venue. Our reception was held in the Visitors Center which is an amazing room as well. The appetizers during cocktail hour were delicious (people raved about the sliders). The meal was great as well. The professionalism from the staff especially Melissa Sapio (literally amazing) made my day so seamless and the best day of my life. Would recommend having a wedding there 100%! Loved every second!! Melissa and the team at Winterthur/ Restaurant Associates were amazing! Melissa was extremely reponsive, helpful, professional and sweet throughout the entire process. She helped with several last minute changes, including the day of, and made the night go extremely smoothly. Winterthur was a BEAUTIFUL location to get married and I loved every minute of it. I cannot speak highly enough of the team there - you will not regret it! Melissa is the absolute best — can’t thank her enough for all of her help and making the process as easy and stress free as possible. Had a total dream wedding here. Literally searched far and wide between D.C. and N.Y.C. 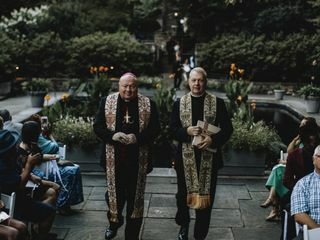 and could not find a more beautiful venue (gorgeous architecture, rolling hills with beautiful flowers, tall, glorious trees... there is so much land that this venue is its own zip code). 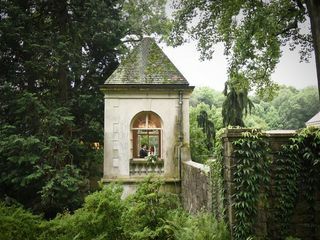 Was the perfect backdrop for a complete enchanted/secret garden/English/French countryside wedding. And if its stunning views were not enough, the food is delicious and the people are great to work with! Melissa is gem and recommended excellent other vendors to work with as well. We live in San Diego but have family on the East Coast but it was totally worth the schlep to Winterthur. Just...perfect. I want to get married there once a month. Everything about the venue was terrific! Melissa was amazing to work with...very pleasant, professional and accommodating. While the weather wasn't on our side Melissa did everything possible to make the night amazing! I actually think we were better off in the mansion!! Everything from the venue (Reflecting Pool & The Galleries) to the food to the wonderful staff made our wedding the most amazing day ever! Melissa was a dream to work with and made sure everything was seamless from start to finish. Our guests loved how romantic and intimate the whole evening was and couldn't stop raving about the food. The day was an absolute dream! 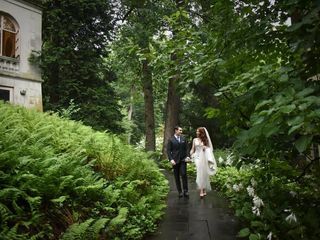 It was a dream to have our wedding at Winterthur and I cannot recommend it highly enough. They were incredibly accommodating to work with; because they only have 1 wedding a day, they are very flexible. It was great to have the whole place to ourselves that day. Melissa, the events planner, was so helpful, responsive, and tolerant of my many, many questions. The grounds are gorgeous and the architecture is stunning. The food was delicious and the staff was very professional. It was beyond anything that I could have imagined; we had a dream wedding. I had only every heard amazing things about Winterthur staff and the venue itself and they did not disappoint! Melissa was amazing to work with, and she and her team made the day run more smoothly than I could have imagined. Even though it rained and we had to move the ceremony and cocktail hour inside, our family and friends raved about how gorgeous even our "backup" option was! It's pretty rare to have a venue with such breathtaking indoor and outdoor locations. The food and the service were incredible! We would definitely recommend Winterthur to anyone! Having our wedding reception at Winterthur was the best and easiest decision we made. Working with Melissa was a pleasure. She had answers to all questions and possible scenarios was very kind and calm which helps make you feel calm! They recommended great vendors and the food was spot on! Our guests couldn't get over how gorgeous the venue was and how kind and professional the staff was. The night was flawless if there was an issue they did a great job of fixing it b/c I didn't notice a thing. I would recommend this gorgeous venue to any bride looking for a romantic setting and I doubt you will find better food or service! Winterthur Estate and Garden is a beautiful setting for a wedding. We visited many other sites but none compared to Winterthur. Very professional, and accommodating in all aspects of service. Top Quality! Our wedding at Winterthur was everything we dreamed it would be and more. We were married in early October 2016 and had our ceremony and cocktail in the gallery space and our reception in the Visitor’s center. We were scheduled to have our ceremony outside at the Reflecting Pool, but due to rain (Hurricane Matthew) we decided to move the ceremony and cocktail hour inside – which was just as beautiful!! One of the compliments we heard over and over again from our guests was about the professionalism of the Winterthur staff. They are top notch. Melissa Sapio is an excellent event manager and her professionalism is impeccable. Melissa made every step of the planning process and execution details of the big day run incredibly smooth. When we had questions leading up to the wedding day (and we had a lot), she always responded in a timely manner and went out of her way to accommodate our special requests. For example, we were interested in serving mini chicken and waffles during our cocktail hour (an item not on the menu) and her and the catering staff made it happen! Zanthia was our bridal attendant for the day and was SO on top of everything! She made sure our bridal party was taken care of at all times and that all of our stuff (photo frames, cards, signage, etc.) was boxed up neatly and ready to take home at the end of the night. She even made sure the bridal party was covered with umbrellas so we didn’t get wet before taking photos. Thank you Zanthia! When you book at Winterthur they provide a cake from Masters Baker. For food we chose the portabella crusted chicken and scallops and short rib as our entrée options – both were delicious and were served in a timely fashion by a professional wait staff. With 6 appetizer choices at cocktail hour and our generous entrée portions, no guest left hungry! Thank you SO MUCH to everyone at Winterthur for making our wedding day extra special, your efforts made this a phenomenal day...one we and our guests will never forget! Book It! Winterthur made my daughters wedding a once in a life time -wonderful experience for all! The Winterthur staff was professional, efficient, friendly, full of good advice and prompt answers to our questions, unsurpassed experience, I could go on and on. Not a detail was overlooked. The staff was everywhere, attending to everything..we never had to think about anything except enjoying my daughter, her new husband, and all of our family and close friends. The beauty of the setting is indescribable with so many beautiful spots for photos and many, many ceremony and reception sites to choose from (both inside and out). They even created a back-up plan for rain! They suggested two fabulous cake makers...from the moment we booked (and do this well ahead of time..) to the moment the bride and groom left in their limo- I would not have changed one thing!! Worth every penny to start our young couple off on their new life in the best possible way!! Winterthur and Staff- Thank you! We love you all! Winterthur was a dream come true for our daughter. The cocktail hour was held at the reflecting pool. It was gorgeous,every guest remarked on its singular beauty. 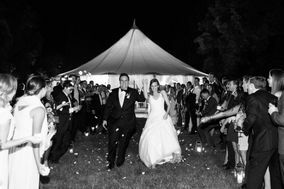 The reception was held under a tent just steps from the reflecting pool. The food was outstanding from the first hors d'ouevre to the last bite of wedding cake. The service at both events was superior. The catering managers at Winterthur made the planning for the wedding a pleasant and memorable time for us. They answered every email promptly and with great concern for our needs and wishes. The tasting was expertly prepared and delivered. The chefs were quite pleased to make every and any adjustment to please our daughter, the bride. The whole staff was completely knowledgeable and totally confident In their product. All of our guests remarked about the quality of the food and service. Everyone was enchanted by the venue. We cannot begin to thank the professionals at Winterthur for the impossibly beautiful wedding our daughter had. Their gracious attention to every detail was evident all evening. I highly recommend a visit to Winterthur if you are planning a wedding. You will not be disappointed . We were very impressed with the professionalism of our coordinator, Melissa Sapio. She was helpful, calm, and patient. The wedding day went as planned, and all of the staff was very professional. We have only gotten positive feedback from our guests. Everyone said it was wonderful. First class.